I especially love how the asparagus tastes in this recipe and you just may become a believer in artichoke hearts after this! 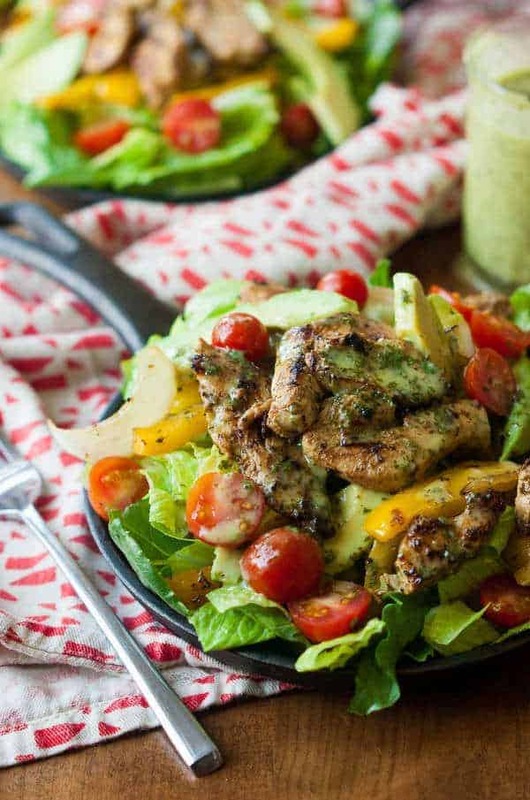 It’s one of my favorite chicken salad recipes. This recipe is also clean, gluten-free and dairy-free. It’s quick to throw together. I especially love how the asparagus tastes in it and you just may become a believer in artichoke hearts after this! I totally invented it myself and I love it – hopefully, you will too. It’s a great example of a main dish salad that will fill you up and help you lose weight. I love meals I can make one thing and not have to have a whole bunch of sides. This is also great because you can make it for one person or ten. The kick from the garlic, the crisp asparagus, and the yummy dressing make it one of my favorites! Plus it has no carbs, gluten, dairy or sugar. I’m not going to lie to you though, it’s kind of an adult salad. Well, at least none of my children like it. But it’s quick and easy for me to throw together when I want something healthy that tastes good and then I can make something for the children that they like and I would rather not eat. I often cook the asparagus in the oven, because I love the roasted flavor it gets in the oven, but this method of cooking it in the same pan saves time and is good too. 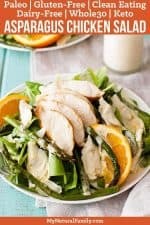 One thing I didn’t mention in the Paleo chicken salad recipe, is that if you have time, I prefer to put my chicken in the fridge for a half hour or so and let it cool down all the way, because if you put hot chicken on the greens and then put the dressing over it, it turns in to a wilty, soggy mess. Plus, while it’s cooling down in the fridge, I can serve my children their dinner or just have time to clean up or help with homework without worrying about it burning. I used to make this a lot when I had really young children and didn’t get to eat dinner until later. I would get it all made and just have it waiting in the fridge for me when I had a free minute to actually eat, which often wasn’t until the kids were in bed. Thank goodness I don’t have to do that anymore. But you do what you have to when you are nursing and have other young children that don’t understand that Mommy needs some peace and quiet to eat for a minute. I also want to add, don’t skimp on the fresh garlic. It’s so good and helps give it a bite. Garlic powder will not work in this salad. Plus, it is SO healthy for you to eat fresh garlic. I always feel really good after I eat this salad with fresh garlic in it. Please let me know if you like this salad and if you have any tips for me or my readers! We absolutely love this salad! My husband said it is one of his favorites. 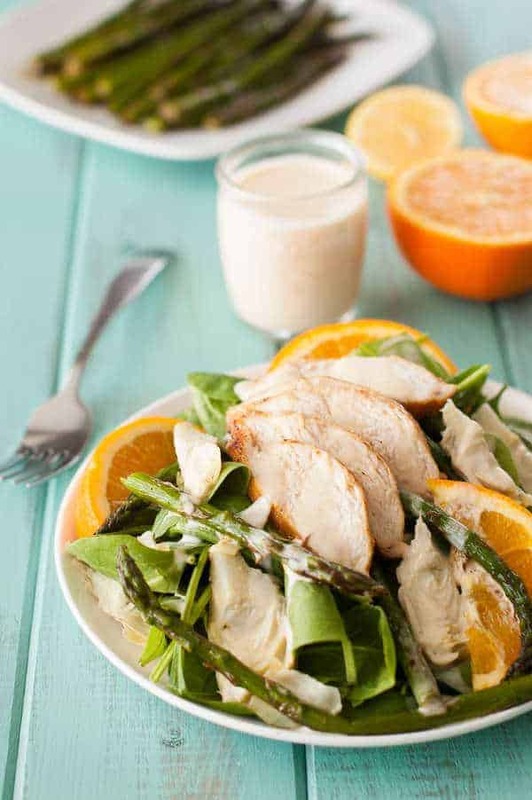 I added orange slices for color and added some citrus juices to the dressing for a little extra flavor. In a mixing bowl, combine the mayo, salt, olive oil, lemon juice, and orange juice. Whisk together until smooth. Refrigerate until needed. Heat the 2 T. of Olive Oil in a medium sized frying pan. Season both sides of the two chicken breasts with salt and seasoning and place in the hot oil. Cook until both sides are golden brown on medium/high heat. Cover pan with a lid and continue cooking the chicken until cooked through, about 7-8 minutes, turning occasionally. Remove the chicken to a plate and let sit for 15 minutes to cool. While the chicken is cooking, add the asparagus to the same pan on medium.high heat. Toss in the cooking oil and cover the pan with the lid, removing to toss occasionally, until the asparagus is bright green. Remove the lid and add the garlic. Continue to saute for another 30 seconds. Remove asparagus and let cool. Assemble the salads by dividing the spinach between four plates. Slice the chicken breasts, topping each plate of spinach with 1/2 a chicken breast each. Divide the asparagus and artichoke hearts between each salad. Serve with the chilled dressing. This looks wonderful…I am on a salad kick right now. I definitely want to try this! I love collecting pretty and healthy salad recipes. Thanks for adding a new one to my collection. Beautiful salad, love that its Paleo as well! This sounds soooooo good! Thank you so much for sharing! I am an artichoke fan, thanks for the recipe! I love Artichokes, thanks for the recipie. This recipe sounds delicious! I would love to try it. This shows us a great way to eat our veggies, too. This looks really good. Thank you for sharing. This looks delicious! Artichoke and spinach are my two favs…thanks for the recipe! this looks and sounds delicious. I am going to try making it. Commenting for another giveaway, and chose this post because this salad sounds sooo yummy! I love salads, ones made with baby spinach the best. Adding chicken, asparagus, and artichokes just makes it sound even better. Pinning this too so I have it for future reference!